Interior spiral shell sections have been cut away from a very large conch shell to make a hollow container. There are three small perforations drilled in the body of the shell and one small hole at the larger end of the item. There are some encrustations adhering to both interior and exterior surfaces. 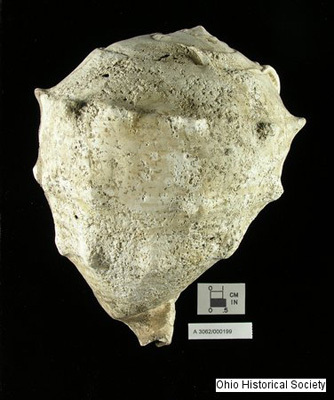 The shell is white, very pale brown and light brownish gray in color. It may have been used as a dipper. Item was excavated from the Raymond J. Ater Mound in Concord Township, Ross County, Ohio. The Ater Mound was a large, conical burial mound located in Concord Township, Ross County, Ohio. It was built by the people known to archaeologists as the Hopewell Culture (circa 100 BC-AD 500). It is estimated to have been 120 feet long by 77 feet wide and 6 feet high. It was inadvertently damaged by a construction project and the remnant was excavated by the Ohio Historical Society (now, the Ohio History Connection) in 1948. Raymond Baby, the then Curator of Archaeology, directed the excavations recovering many remarkable artifacts, including more than 1,500 beads that once had decorated a blanket used to cover the burial of a child.